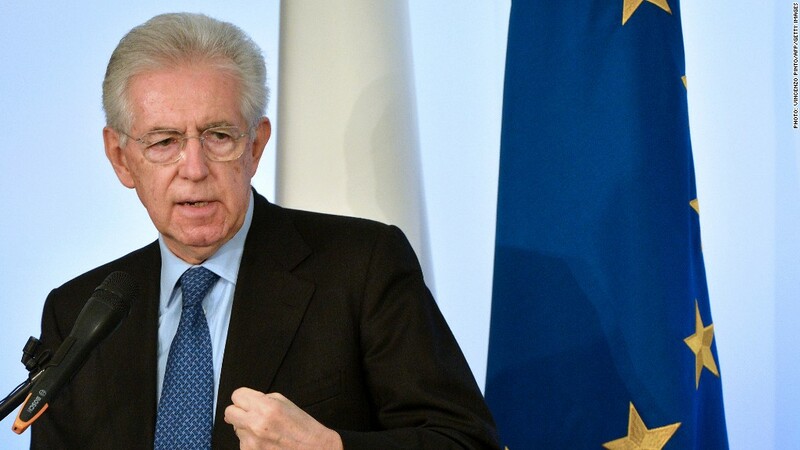 Outgoing Prime Minister Mario Monti has signaled he may be willing to lead Italy again after elections due in February, but uncertainty over the fate of his economic reforms is likely to keep markets on edge in the New Year. Monti stood down, and parliament was dissolved Friday, after former Prime Minister Silvio Berlusconi withdrew his support for Monti's unelected government of technocrats, appointed a year ago to save Italy from the financial crisis then threatening to tear the eurozone apart. Speaking on Sunday, Monti said he was more concerned that his policies survived than taking sides in the campaign but added he was ready to offer advice and leadership if a party or coalition came forward with a program he could support. "I would be much more interested if the Monti agenda - and I apologise if my name appears here - would serve to provide clarity and perhaps help unite the forces," he said at a news conference. Monti, an economics professor and former European Commissioner, has been credited with restoring confidence in Italy, as well as with its eurozone partners and investors, thanks to his commitment to reduce government borrowing and introduce economic and political reforms. "While he may not have thrown his hat into the ring, Il Professore has become Il Politico whether he likes it or not," said Nicholas Spiro, managing director of London consulting firm Spiro Sovereign Strategy. Yields on 10-year Italian government bonds have risen recently on the renewed political instability but remain way below the 7% level Monti inherited a year ago, when he succeeded Berlusconi, who resigned under a cloud of scandal. "Last night I had a nightmare, I woke up screaming. I dreamed of a government still with Mario Monti as president of the council," he said, according to the transcript of an interview posted on his website. Opinion polls suggest the center-left Democratic Party led by Pier Luigi Bersani will win the lower house elections, but may need to build a coalition to gain a majority. Bersani said in a statement on his website that he had no reason to apologize for supporting Monti's program in government and would consider his policy proposals carefully. Analysts at Nomura said a Bersani-led government including Monti in some capacity was the "best case" likely outcome for financial markets but cautioned that even such a government may struggle to implement reforms, particularly if it failed to win a majority in the upper house. "Given all this political uncertainty, we see a non-negligible risk that markets will become unsettled over Italy again early in the new year," wrote Alastair Newton in a research note.